If you’ve ever been on the hunt for a job, you’ve most likely checked out job boards online for finding the right companies and jobs for you. After all, unless your school has a job placement program or are using a headhunter, there aren’t that many outlets for finding work. And overall, a job board is one of the easiest ways for employers to find suitable matches–and the webmasters that run these websites can actually make a significant amount of money. For example, it typically costs employers to post job listings on these boards. So if you are a developer, or if you want to add a job board to your website to help others in your industry connect and find work, ensuring your site is based on a reliable WordPress job board theme is essential. Job boards can turn into a consistent form of revenue, providing recurring income if you have multiple companies that like partnering with your site. In addition, you can charge for other services, like resume building or featured listings, if you want to expand a bit. What Features Should You Look For In Job Board Themes? A few things to look for with any theme are quality of interface design, stability of the code, and the usefulness of the features as they relate to your industry. With job board and employment themes, this is especially important. Both employers and prospective job applicants will be quickly put off by website UI issues, slow page load times, or poor feature implementation. There are huge profits to be made in the job placement industry, so it’s very important to choose a theme that provides room for your business to grow. 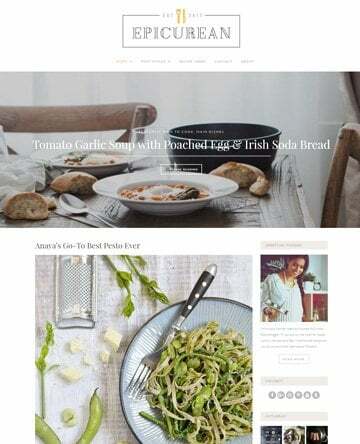 Who Can Use These WordPress Themes? 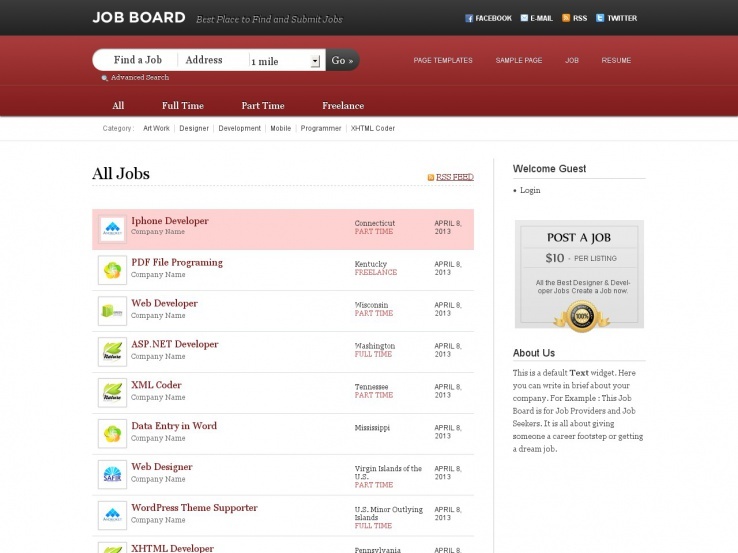 Anyone with the desire to make a job board might consider utilizing a WordPress theme. However, including a blog that focuses on a certain industry is important, too. For example, a large web design job board should be accompanied by an active blog to improve search engine and social media traffic. The content on this type of a blog would obviously serve web designers. This combination makes sense because employers want people who are comfortable in their field. Regardless of the niche of the job board, the following selections should give you plenty to consider! The Job Portal theme brings a professional, clean, and beautiful design along with a set of powerful features for job portals. Job seekers can upload their resumes while companies can browse the resumes and find candidates for their positions. background videos. It also integrates nicely with social media and you’ll find Facebook and Twitter widgets. The blog provides an opportunity to publish useful content and grow your website, while the translation tools make it easy to localize. 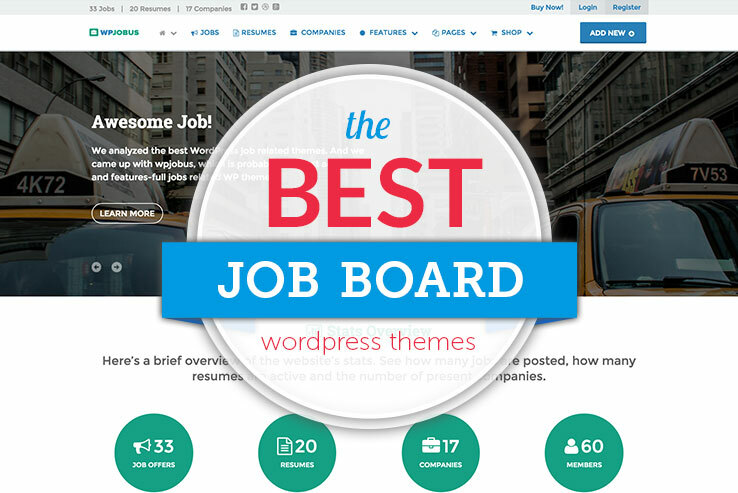 Jobmonster is a feature-rich job board theme with a clean, modern, and professional design. Clients can submit and edit jobs directly from the front-end for admins to review. Employers will also have a dashboard where they can easily manage their company profiles and job listings, view job applications, and respond to candidates. On the other hand, job seekers can upload their resumes from the front-end and make them searchable. They’ll also have their own candidate dashboard where they can manage their profiles and resumes, manage job alerts, and view bookmarked jobs and jobs applied. Integration with the WooCommerce plugin allows you to create job posting packages and manage payments. 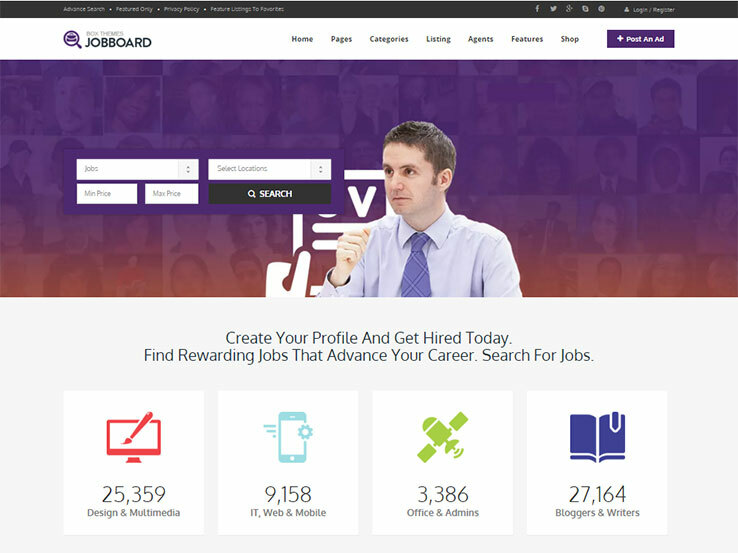 Along with social login capability, integration with Indeed job search engine, advanced custom fields with search, a wide range of layouts, and private messaging between employers and candidates, the Jobmonster theme is a powerful choice. 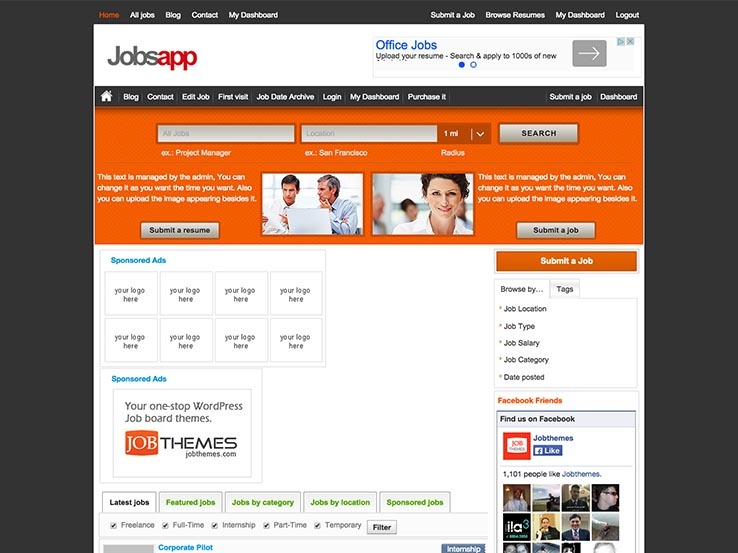 The JobSeek theme is a great option for human resource and recruitment agencies. It comes with Ajax-powered job filtering, the ability for candidates to subscribe to job feeds matching their searches, front-end job submissions for clients, and a well-organized single job listing page. Job seekers can easily create their profiles, upload their resumes, and search and apply for jobs. Integration with the WooCommerce plugin brings paid listing functionality where you can create custom job packages. The template also works well with the WP Job Manager plugin, which provides access to many useful features such as resume management, bookmarks, job alerts, application deadlines, and job tags. 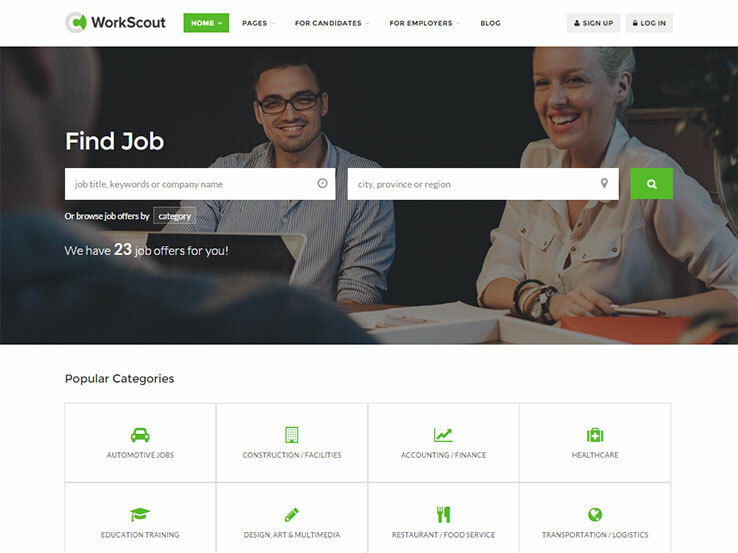 WorkScout is an elegant and professional job board theme suitable for recruiters and employment agencies. It comes with advanced filters for job listings, making it easier for candidates to find relevant job ads. Job seekers can even filter jobs by salary or pay rate. 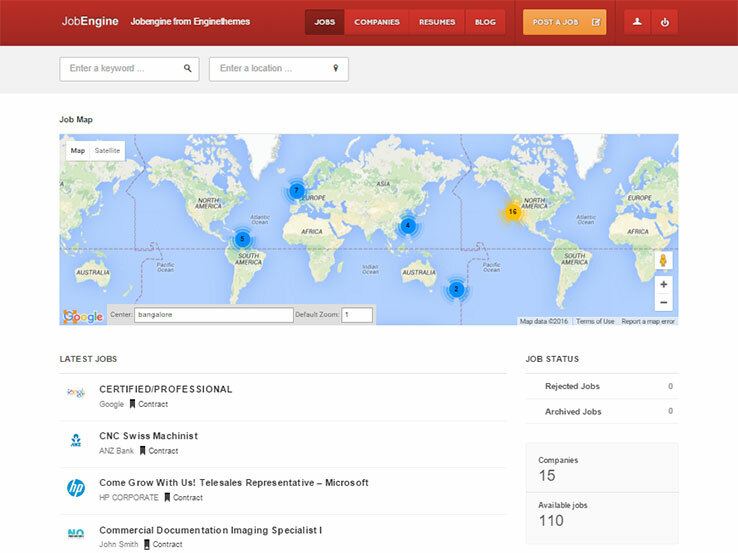 Map functionality allows for job listings and resumes to be displayed easily on a configurable map. The template is based on the popular WP Job Manager plugin that provides access to premium addons such as resume management, application deadlines, job alerts, bookmarking, and paid listings. You’ll also find several ready-made home layouts and page templates to get you started quickly, a drag-and-drop page builder to easily create custom page layouts without coding, sliders, premium icons to add visual appeal to your site, and much more. Directory is a multi-purpose listings theme that includes a design for job portals. Users can register, create their profiles, submit and manage listings or resumes, sort search results, and more from the front-end. Several listing detail page layouts allow for a variety of ways to display listings including with maps, sliders, banners, or Adsense ads. The blog provides an opportunity to publish expert content and grow your job board. Besides, you’ll find support for different payment gateways, advertising spaces, translation tools, hundreds of fonts, unlimited colors, and tons of theme options to make the template your own. The JobEngine theme from Engine Themes is clean, modern, and has one of the best public-facing user experiences of any of the WordPress job board themes on the market. 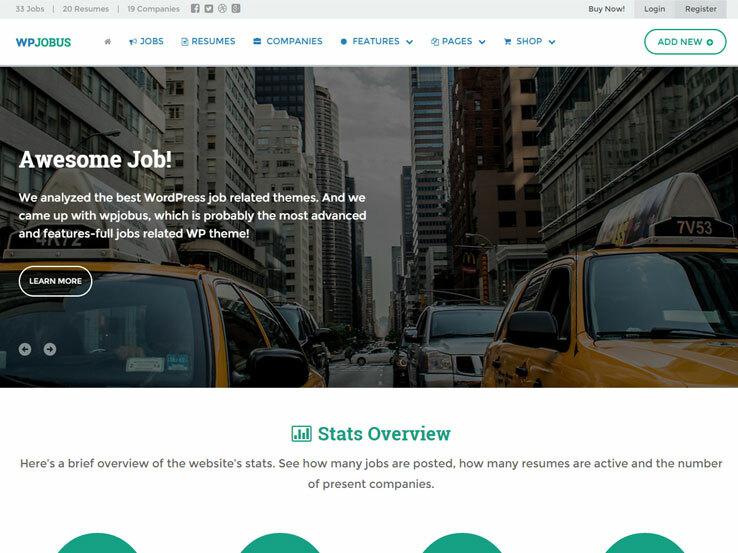 Engine Themes reliably puts out super stable application themes for WordPress, and JobEngine is no exception. Look for great features like AJAX filtering of job listings so users can quickly and painlessly filter listings without having to reload the page each time. Flexible pricing configurations with featured listings allow for monetizing your job board, turning it into a turnkey revenue source. Customizable email templates provide a level of polish and professionalism that other job board themes lack. Jobify is one of the most popular job board platforms available. It boasts a super fast install and setup that will allow you to deploy a fully operational website in a matter of minutes. If you do run into any issues with the setup, you can take advantage of the video tutorials that come packaged with the theme. 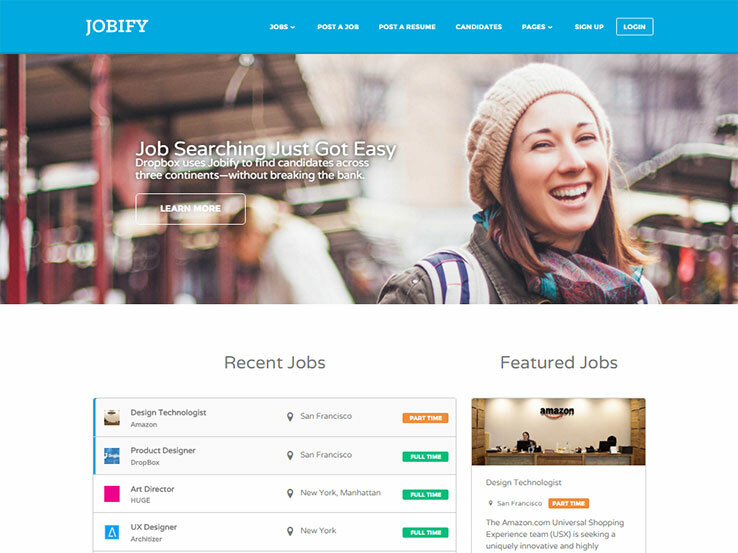 I think Jobify is one of the best looking job board WordPress themes. The design is flat, clean, and modern. The theme is designed with great modern aesthetics like ghost buttons, background image rows, and flat color scheme. Jobify integrates with WooCommerce Paid Listings and WP Job Manager plugins. The WooCommerce add-on allows you to create and sell custom job packages that can be purchased or redeemed during job submission, while WooCommerce integration allows you to sell various other products. The folks behind the WPJobus made the interesting decision to create a multi-purpose theme that includes a job board layout as one of the options. The design is bright, clean, and modern. This theme also has plenty of customization options, no matter which layout you choose. The job board layout, though, includes complex profiles for companies that can be organized into an elegant directory. 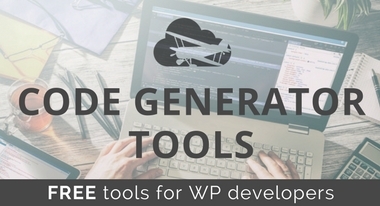 WPJobus doesn’t require any plugin integration for monetization and works with Stripe for publishing featured resumes, jobs or company profiles. The back-end will allow you to customize every part of your website, and the theme also offers responsive and a Retina-ready design to ensure your website always looks great. 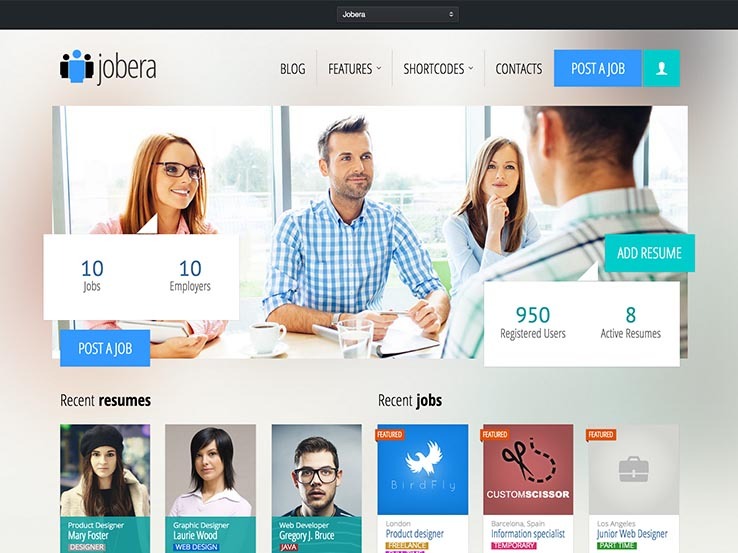 The Jobera theme offers the ideal job portal to feature the most recent job postings in your area or from around the world. It allows front-end submissions so your users can post their own jobs, and the responsive design ensures everyone can view your website on tablets and smartphones. 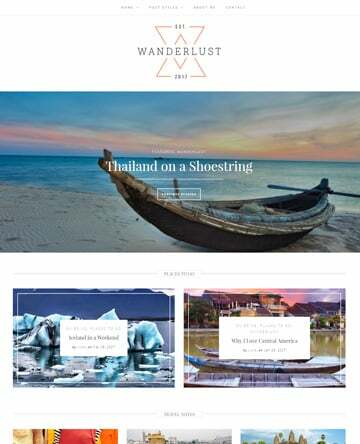 The theme comes with advanced options that are easy to use – even for beginners – and allow you to customize your website without touching any code. The theme also includes custom widgets to add features like social media icons and contact modules. 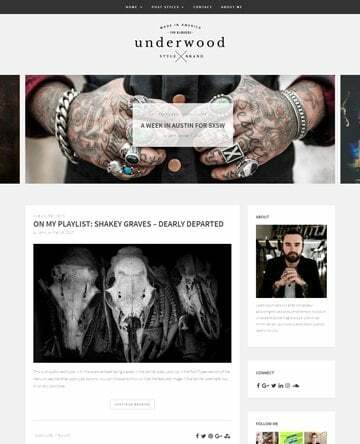 The unlimited sidebars are a great way to make your job site look unique and add additional content to your pages. 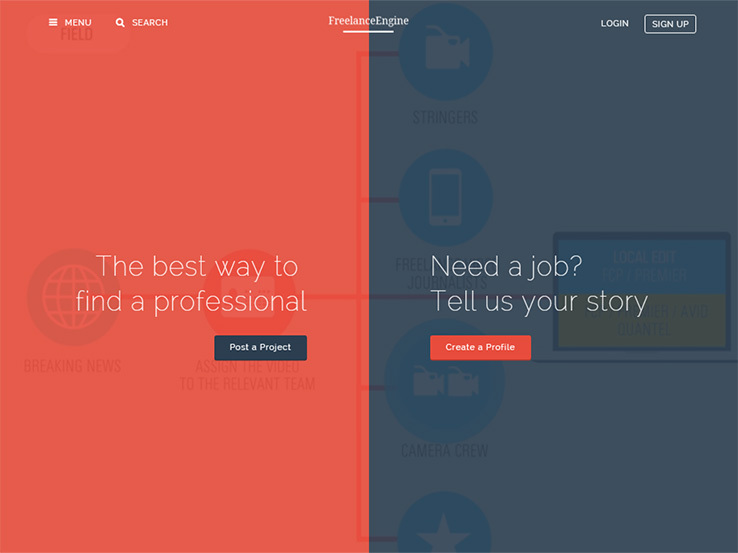 On top of that, each job seeker gets a stunning profile to post images, links, and resumes. The Job Board theme is very easy to use, both on the front-end as well as the back-end of your website. The theme displays all of the job postings in a simple list format. You can separate your different job postings by part-time, full-time and freelance. The Job Board theme will let you set up your job board website in a matter of minutes, thanks to the one-click import feature that lets you import demo content. All you have to do is replace it with your own content and your website will be up and running. The webmaster can manage both jobs and resumes, and the theme comes with a handy system for charging for job submissions. Feel free to customize the submission forms and create multiple job types to assist people in finding their ideal job. The theme automatically displays the location for job posting on a map, and you can choose from multiple payment gateways to collect payments on your website. The Nine to Five theme eliminates all the clutter and has a clean and minimal design with a single focus: to share jobs and get people hired quickly. Your users can take advantage of powerful filter options to locate the ideal job listings, and the auto-complete search greatly facilitates searching for relevant terms. Collect money through the PayPal Payments module and show users where the jobs are located on a Google Map. Multiple currencies are supported in the theme’s back-end, allowing you to post jobs from all around the world. The resume uploader is simple and intuitive, so you don’t ever have to worry about people getting frustrated with the site. Choose from eight color schemes and two skins to ensure your website matches your brand entirely. 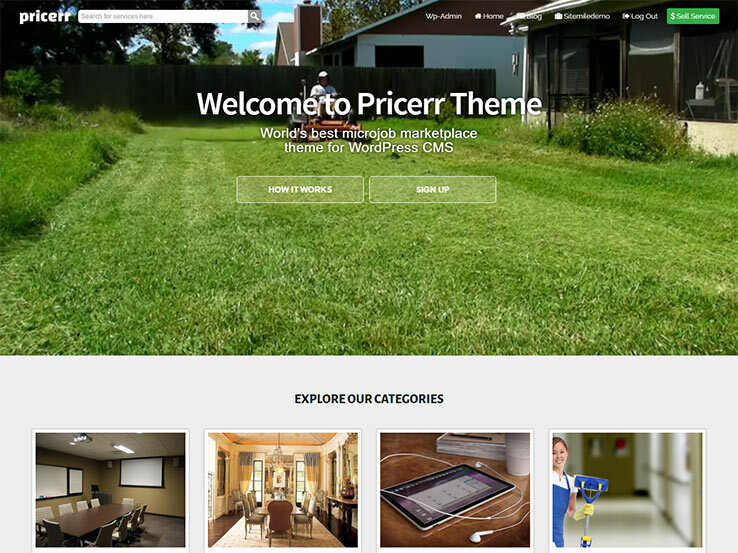 The Pricerr Theme is a perfect way to set up a micro job site, as it provides a nice combination of tools that can be used by both advanced and beginner users alike. The custom job posts allow you to assign tags, categories, pricing, and more. Select from multiple payment gateways to collect payments, and take full control of your job board through the admin area, where you can customize the interface, modify user profiles, and accept job listings from third parties. The Facebook integration is a nice touch, and the email notification system sends out messages whenever someone posts a job or when a job is posted that correlates to a user’s interests and skills. Bitcoins are also supported as an additional payment method, and the integrated blog ensures that you can share your own knowledge and establish yourself as the authority in your niche. 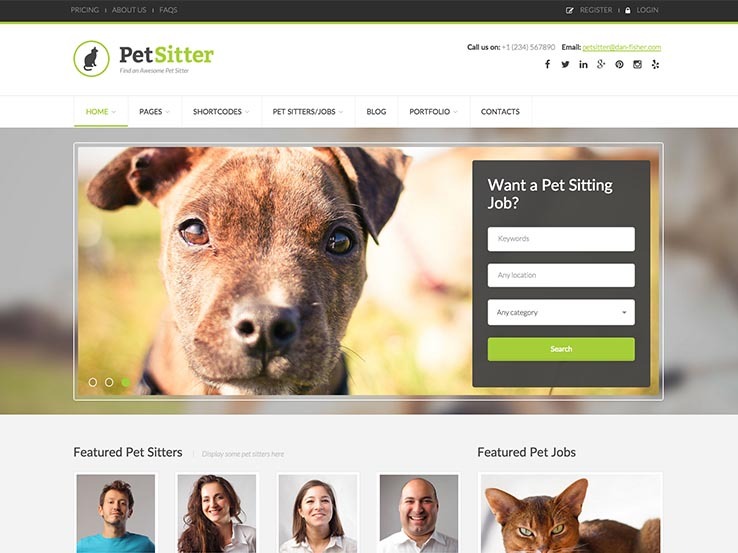 If you’re interested in creating a job site for pet sitters, the PetSitter theme is the perfect solution. It’s designed with specific pet-sitter features that let users connect or share photos of dogs and sitter profiles. 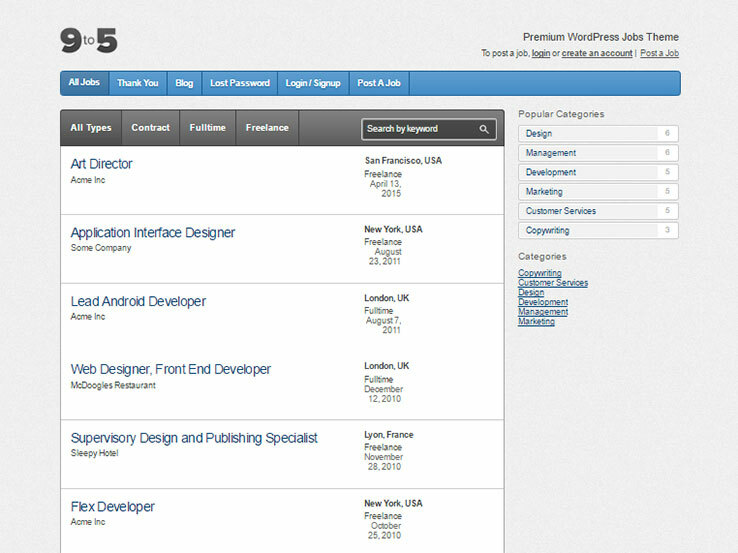 You can also modify the full-width slider to display the most recent job listings available. Pet owners can easily submit their own jobs through the friendly user interface, and more than 40 shortcodes ensure that you never have to touch any code. PSD files are also included with the theme so you can easily customize the design if you are a more experienced user. PetSitter is compatible with the WP Job Manager plugin, and the front-end of the theme helps you display profile images and information about all of the pet sitters who are looking for jobs. Choose from unlimited colors to give your website a unique look, and choose any of the Google Fonts for beautiful typography. The Jobsapp theme is a child theme for Jobroller, which means you don’t have to worry about losing any changes you make when the theme updates. The custom job form allows you to quickly publish new job listings, and the job seekers dashboard makes it easy for your visitors to upload their resume and apply for jobs. The theme also includes a dashboard for employees, where they can easily manage all the job listings whether they are still active or expired. Jobsapp’s elegant and professional design is sure to bring job hunters and companies to your website, since it has a minimalist design that puts the main focus on your content. The job application form is easy to use, and you can even change your colors by choosing between 13 different color schemes. A contact form is included with your purchase, and translation support comes along with the theme so you can reach a global audience by translating your website into any language. Along with social modules, an area to include ads and a custom login box, the Jobsapp has everything you need to make a successful job board. 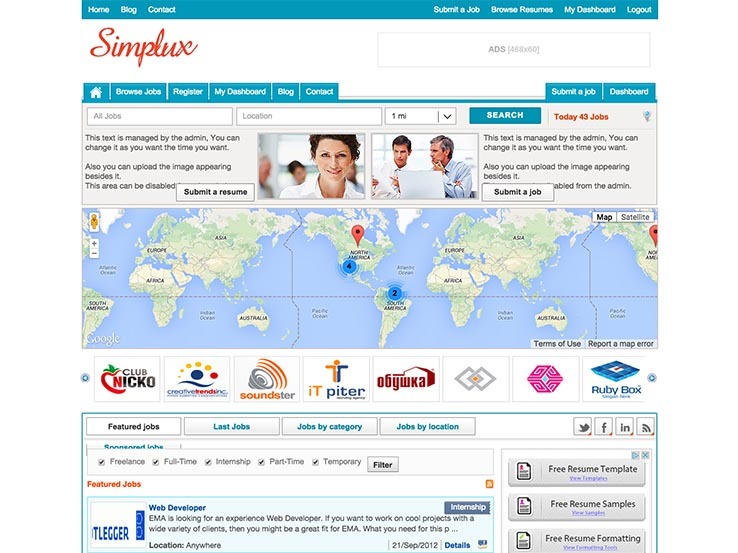 The Simplux job board theme has bright colors to grab the attention of your visitors, along with a large map on the homepage that assists people when they are looking for a job in their area. The custom job form can be modified however you want, making it easy for job applicants to apply for jobs. Both employers and job seekers get their own dashboard, where they can manage listings and resumes. You can even include an eCommerce module for selling merchandise or eBooks. 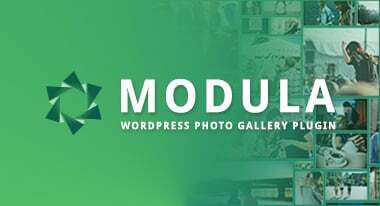 Simply connect the module to a PayPal account and start selling. 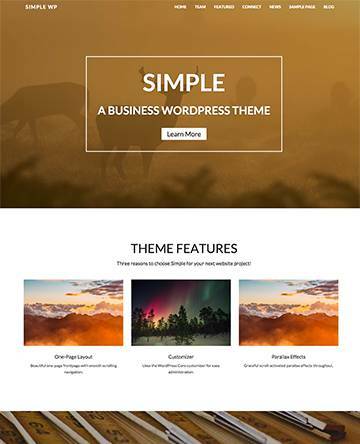 Simplux theme includes several page templates that allow you to add full-width pages, contact forms, and more. The custom-built widgets facilitate tweaking the layout of your pages, and the built-in SEO settings will help increase your search engine rankings. The theme is completely responsive and cross-browser compatible. It also offers a social module to quickly share job listings on places like Twitter and Facebook. On top of that, Simplux includes a custom login box, unlimited colors, and more, so start testing out the demo to begin making money with your own job board today. 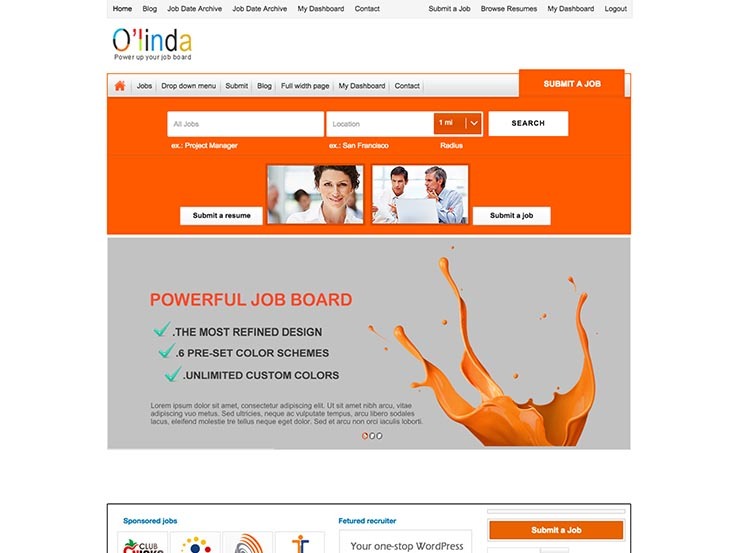 The Olinda WordPress theme has all the features you could ask for when looking for a job board theme. Olinda is completely responsive, which means your website will look great even on mobile devices. 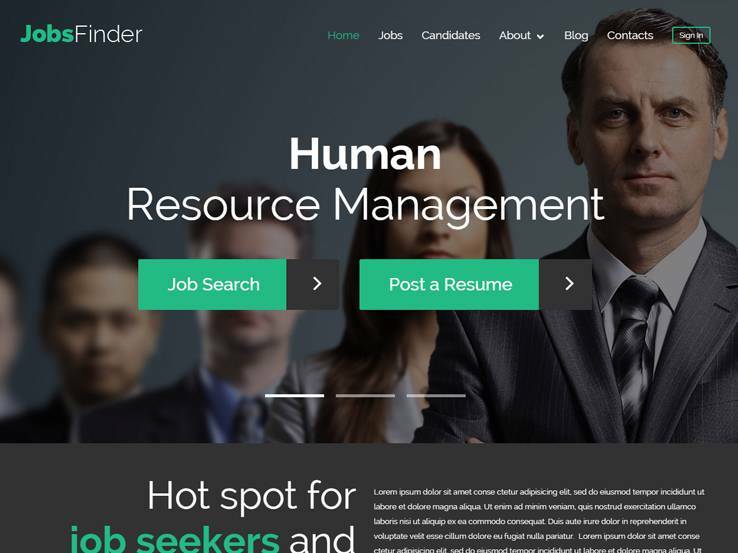 This is an ideal theme for recruitment agencies and HR professionals. It offers a custom job form for submissions, along with a job seekers dashboard that helps job seekers to manage their resumes and job submissions. Another noteworthy feature is the elegant, professional design with several color schemes so you can effortlessly brand your website. Additionally, the employer dashboard makes it easy to check the status of job listings and pending applications. The theme includes several page templates for contact forms, full-width pages, and more. A contact form keeps you in touch with your customers, and the custom built-in widgets make it easy to tweak the layout of your website on the back-end. Localization support means you can easily translate your website into any language, while the social media buttons let you broadcast job listings on various social media outlets. The custom login module speeds up the login process, and the advertising area is an added benefit, allowing you to further monetize your website. The Responsive Micro Jobs Theme has a powerful set of features and functions a little different than the other themes on this page, as it focuses on replicating sites like Fiverr and PeoplePerHour. This means users can come to your site and sell their own services, posting their skills and accepting payments from those who may need things like web design or writing. Various demo layouts and colors are included, so feel free to play around with the designs to meet your branding needs. This is a completely responsive theme, which ensures your website will work even on smaller devices. 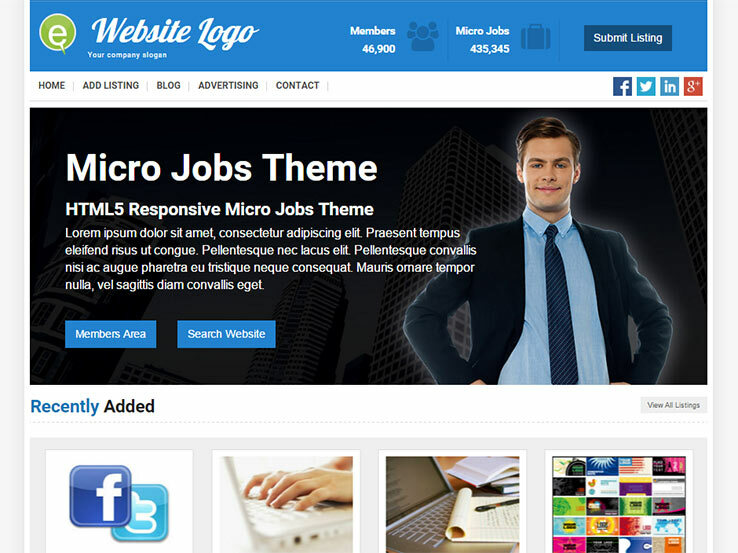 Over 20 payment gateways are provided through the Responsive Micro Jobs Theme. No plugins are required to make the theme work perfectly, and a full workflow system makes communication between sellers and service providers seamless. You are able to send attachments and stay up to date with the work process until the job is complete. The theme has open source code, so you can easily modify any aspect of the theme if you are a more experienced user. You can also set up your own commission system, which helps you earn extra revenue for each micro job sold. In addition, the bidding history area ensures that all members can remember which bids they have placed. Finally, membership plans allow you to bundle listings and website access together. Users with membership access can submit multiple listings, read and send private messages, and access restricted content. Jobright presents an effective solution for your job board needs. The premium child theme allows you to easily convert your entire WordPress blog into a job board, where employers can post jobs and job seekers can submit their resumes. 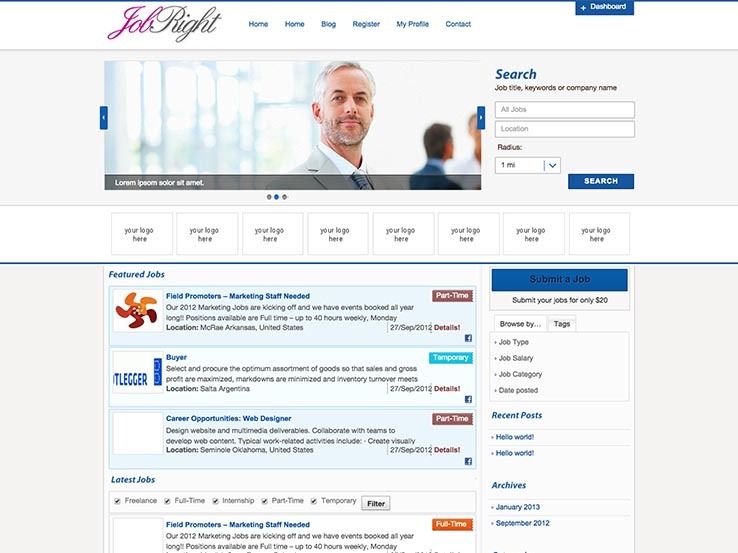 Although it’s a less modern solution, we still like the Jobright theme because it has a variety of features that allow you to create an impressive job board website. The custom job form is easy to use and it lets you gather submissions and organize them on the back-end of your site. This is the first step in the job submission process, which is easy to complete thanks to theme’s implementation of the job form. A contact form is included, so your visitors can get in touch with you should they need any help along the way. This is a great way to provide customer service and resolve any questions they might have. The job application form connects job seekers with the right companies, and you can customize it to fit a very specific niche should you choose to do so. The custom-built widgets make it easy to add content to your pages, while localization files allow you to translate your website and reach a global audience. The Babysitter WordPress theme is geared specifically toward those needing childcare, and those looking to provide childcare services. The theme has a powerful set of features on the back-end. The design is playful and colorful, which is a great choice for this particular niche. 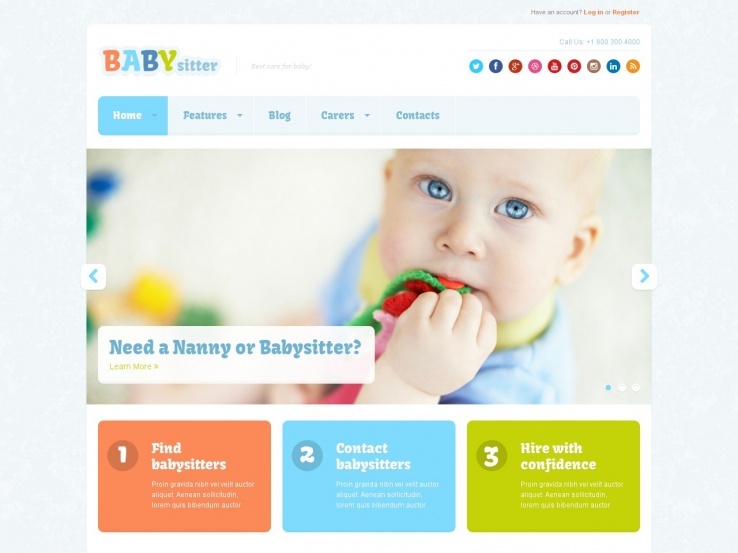 This is a completely responsive theme, so parents can search for babysitters even when they are on the go. The front-end submissions allow anyone who lands on your website to submit their own listing. Over 40 shortcodes are packaged into the Babysitter WordPress theme, which means you can easily add extra design elements like buttons and columns without getting your hands dirty with code. The Google Web Fonts will ensure your website has beautiful typography that’s easy to read on all devices, while various other customization options will let you customize the website to your own liking. The FreelancerEngine WordPress theme works similar to Freelancer.com, as you get to develop a full freelancer marketplace. For example, if you’d like to assist writers, developers, or other freelancers in their job searching efforts, this theme will give you all the needed tools. It’s fully responsive, so people can search for jobs on mobile devices, and it doesn’t require any coding knowledge on your part to set up. The homepage lists all the available job listings, and the individual job pages are easy to customize with specific position info. Both employers and job seekers get their own profile management modules, which ensures people can stay organized and get the right people in the right positions. The smooth escrow system is essential for collecting payments, while the drag-and-drop page builder cuts down on the amount of development time. 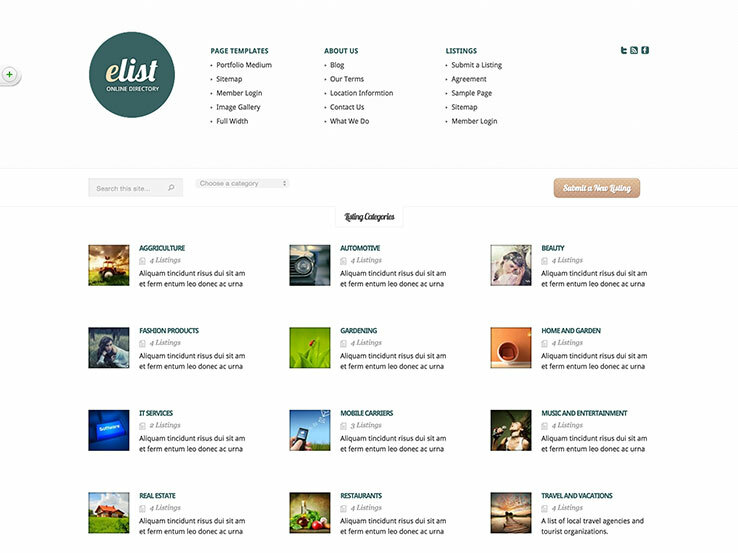 Meet eList, a clean and simple directory theme from Elegant Themes. It offers a great option for creating job boards. Users can easily register, submit and manage their job listings from the front-end. It integrates nicely with the WooCommerce plugin, which means you can create job packages and paid listings and monetize your job board. The template comes with several page templates, which will save you time as you won’t need to create pages from scratch. Besides, there’s a user-friendly theme options panel for controlling your site’s appearance and settings, a blog to help generate more traffic, social media icons, custom form builders, and unlimited color options for branding purposes. 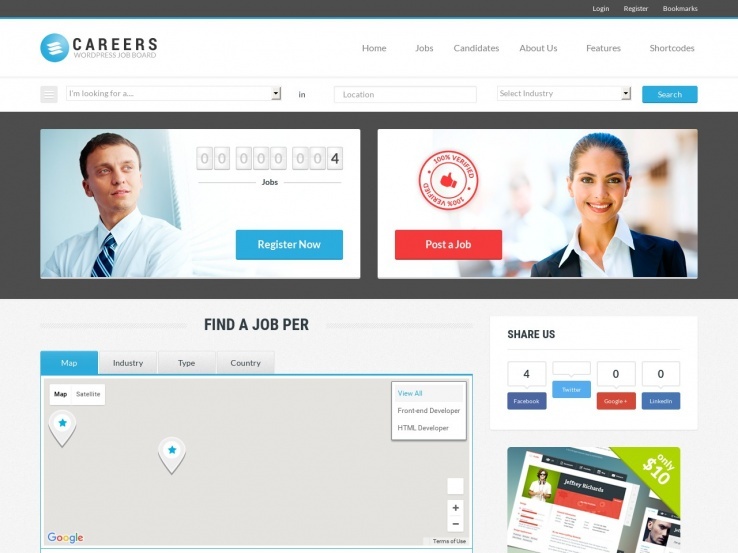 The Careers theme has a modern design and an impressive feature set for building a job portal. Users can register either as a company or a job seeker. Recruiters can post job listings while candidates can upload their resumes and apply to jobs, all from the front-end. An advanced search function makes it easy for candidates to find relevant jobs. The template integrates with the Stripe payment gateway, and you can create unlimited subscription plans. Besides, it comes with Google Maps support, translation tools to easily display your site in different languages, hundreds of font options, social media integration, and a responsive design that looks beautiful on mobile devices. 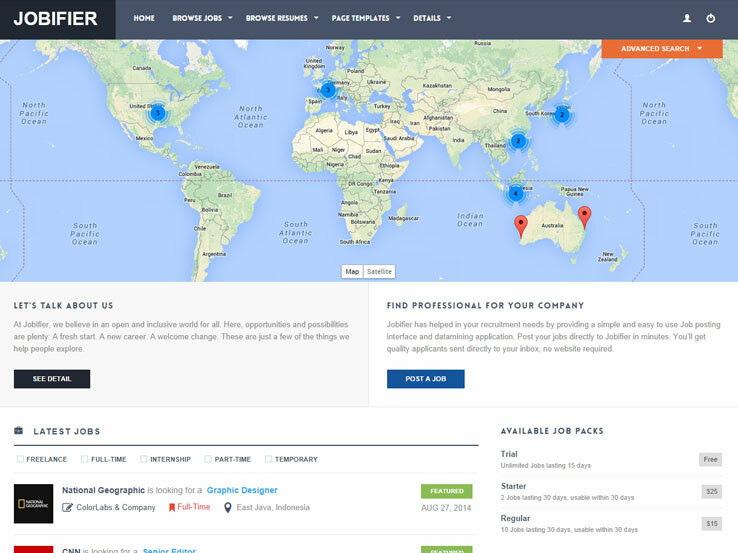 The Jobifier theme from ColorLabs is an attractive, clean, and fully responsive job board theme. It comes with support for both job seekers and employers looking to hire new employees. The two features that deserve special mention are the front-end submission user interface, which boasts a pleasant color scheme and is easy to use, as well as integration with Google Maps to display employment opportunity distribution. The theme also includes a recruiter role, which is ideal for third parties who help connect job seekers and employers in order to facilitate the hiring process. Jobifier supports several payment processors, PayPal included, and comes with Indeed integration, responsive design, and admin panel that lets you style every aspect of your website. Thanks for sharing, but can you recommend a easy for post and with simple design job board theme. 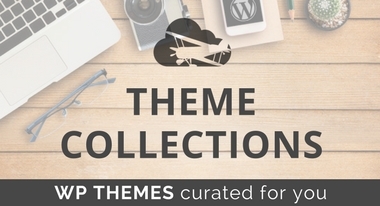 I found huge list awesome job creating themes for wordpress , looks very helpful this post. Recently we published a plugin at wordpress.org “Job Board Manager” , easy to use via short-code display job list, job single page, extend as your needs for settings , themes and more. Great post. I’m looking for job board theme that have the features of seek dot com dot au. So hard to assess from all the selection. 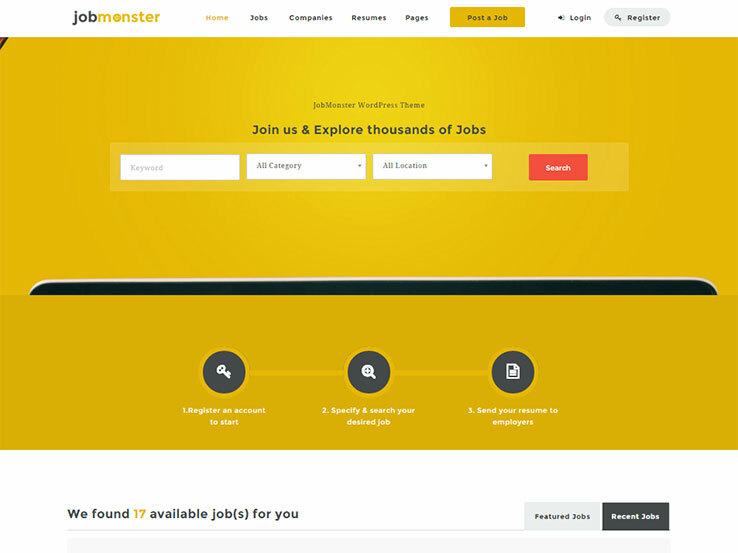 Hi,\n It looks like they have a custom website, but take a second look at JobMonster or JobSeek. You might find them very similar. Hi Alice,\n Thanks for reaching out. 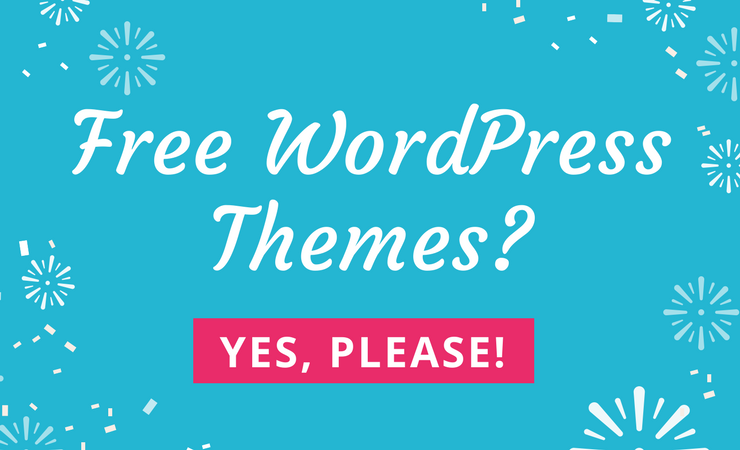 Both are quality themes with lots of great features. Do you have a specific design feature or function you are desiring for your website? Hey i bought workscout theme upon your recommendation list. It is good one! has easy to install and setup.